After going back for a little nap after lunch, it was time to meet up with the visiting foodies for one last meal. A change of heart a couple of weeks ago saw us seated at a window-side table in Yan Toh Heen (欣圖軒) in the InterContinental Hong Kong, with gorgeous views of Victoria Harbour. This was once my favorite restaurant to take visitors, and I was pretty excited about coming back after a few years' absence. Unlike at lunch today, I was tasked with putting the menu together for dinner, so I tried to have a combination of Cantonese classics along with dishes I felt would be more interesting to visitors without access to good Cantonese/Chinese food. The amuse bouche tonight was a prawn on a bed of steamed egg custard, with starch glaze flavored with celery and chives. I was rather disappointed that nobody bothered to tell us what it was after setting it down. I had expected better. Well... I didn't get it. But then again I don't really get many of the abalone dim sum items, anyway... Yes, you get a decent sized abalone, but it's not the type of dried abalone that's been braised for hours to perfection. Neither is it the live abalone with the springy, bouncy texture and fresh flavors. Instead you get something that's neither here nor there... with a flabby texture and boring flavors. And at almost USD 20 for this... the price was just wrong. Yes, there's shredded crabmeat in the middle. Yes, there was that familiar crispy taro shell surrounding a layer of taro mash. But something just seemed a little off here, and I couldn't quite put my finger on it. Peking duck (香烤片皮鴨) - our visitors requested this, to no one's surprise... Foodie Girl and I admitted to the visitors that we mostly eat Peking duck when entertaining visitors... Honestly, I can get roast goose and roast duck anywhere that serves Cantonese roast meats, including my beloved Yat Lok (一樂燒鵝). So what's the big deal about Peking duck?! Besides, if I wanted to have a whole roasted animal, I'll take a good roast suckling pig any day. The first serving is always the skin, and here they've served us only the skin, with barely any fat underneath and no meat here. I suppose this is seen as more upscale and refined, but me? I like my duck fatty, and crispy skin without any fat underneath just isn't as satisfying to me. They brought out so many condiments that it took up most of the Lazy Susan on our table. There were three different types of sauces, each paired with two different toppings. The classic hoisin sauce (海鮮醬) with spring onion is a no-brainer. The plum also works, but the accompanying green papaya added too much acidity. The worst was the gochujang (고추장), and thankfully I didn't add the pomelo pulp as suggested. So... it would seem that the classic is still the best. Steamed leopard coral trout (清蒸東星斑) - you can't come to a high-end Cantonese restaurant without having steamed fish, and this place has been doing a good job with their steamed fish for the last 20 years. What's even better is that they can bone the fish and steam it on banana leaves - which is a pretty option to exercise when you have visitors from overseas who may not be used to eating a whole fish. Steaming the fish in pieces would naturally overcook the fish a little, but in this case it was just about perfect. Minced duck in lettuce wrap (鴨崧生菜包) - the second serving from our Peking duck. Well, this was disappointing. The minced duck was completely overcooked. FAIL. Stir-fried pea shoots with bamboo piths (竹笙炒豆苗) - pea shoots are in season, so it's not surprising that they're very young and tender. The bamboo piths were fine, too. But what's with all that thick starch?! Absolutely unnecessary, and just make the dish feel cheap. Oh and the other thing I'm a little miffed about? They served us the veg dish when there was another dish coming. This should have been served right before, or with, the rice or noodle. A restaurant like this should know better. Wok-fried lobster with crabmeat roe and fresh milk (龍皇炒鮮奶) - well, this didn't turn out to be what I had expected. I've been pretty spoiled by my favorite private kitchen, and I thought the fried milk would come out a lot fluffier. I also thought it would come with crab meat, but reading the Japanese translation would have told me that it's actually crab roe, sans meat. And the roe actually didn't have much flavor. Oh well. This was OK, but not very special. Steamed rice with mixed air-dried meat (臘味煲仔飯) - this is a homey winter favorite for many of us, so I wanted to show it to our visitors. Unfortunately, though, I don't think it went down very well. The preserved pork sausage, liver sausage, preserved pork belly, and preserved duck were all a little on the salty side - especially the duck. We would normally take it with a good amount of rice that has the duck fat mixed in, but the claypot was on the small side tonight - yielding only 6 bowls of rice, supposedly... So the ratio of meat to rice was all wrong. I saw some of the visitors eating the rice on its own, after drizzling some soy sauce on top. The other disappointment here was that the waiter didn't serve us any rice crispies. It seemed incredible that there would be no rice sticking to the claypot after the extended cooking period, so where were the chunks of rice crispies?! That would have provided a little more pleasure to this dish... even if the waiter had to cook it tableside for a little longer. We didn't have room for dessert, and just nibbled on the mignardises. I hope the almond cookies tasted good to the others, because the roll of jelly I picked up tasted of absolutely nothing. I brought along a couple of bottles to share. 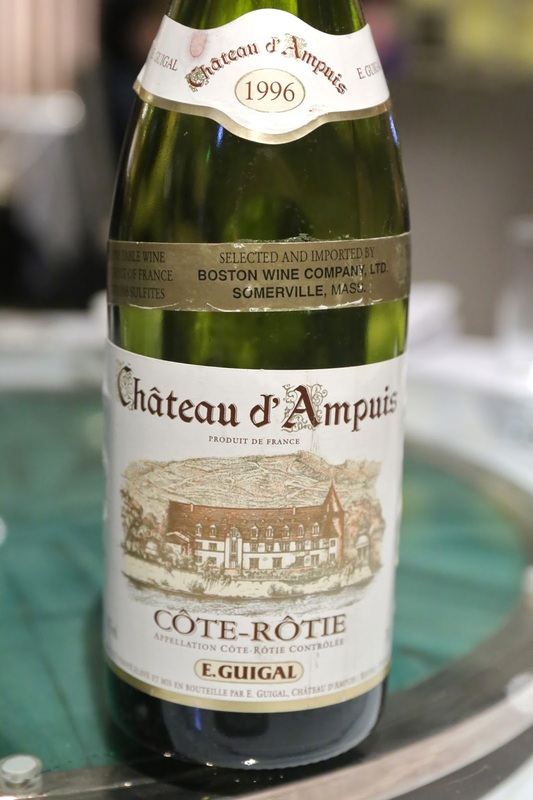 1996 Guigal Côte-Rôtie Château d'Ampuis - very floral with violet notes, along with leather and animal notes. Acidity was a little higher than expected, which was a shame. 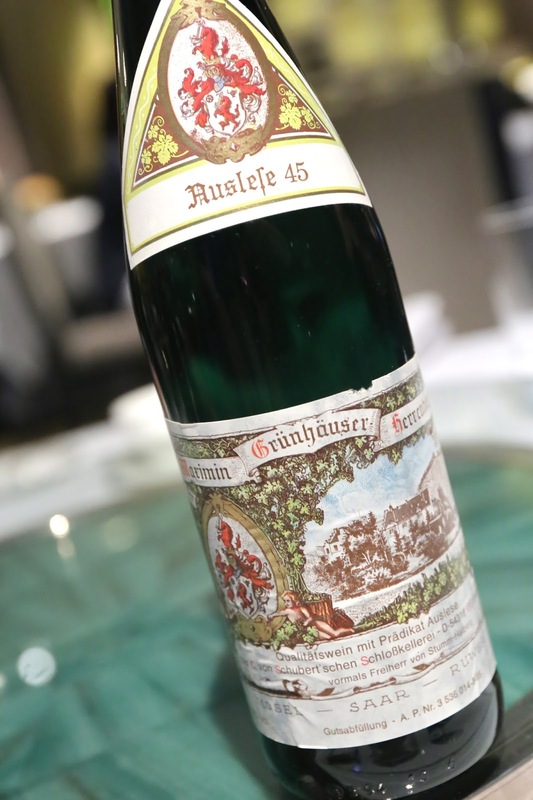 1994 Von Schubert Maximin Grünhauser Herrenberg Riesling Auslese 45 - classic nose of white pepper and petrol, with a little polyurethane. Somewhat on the sweet side.